Gotcha Day walk and a little about UKI | Can I Bring the Dog? Chico’s Gotcha Day was clear and cold and windy, but at the warmest part of the day we bundled up and took the Chico and Sophie for a walk. 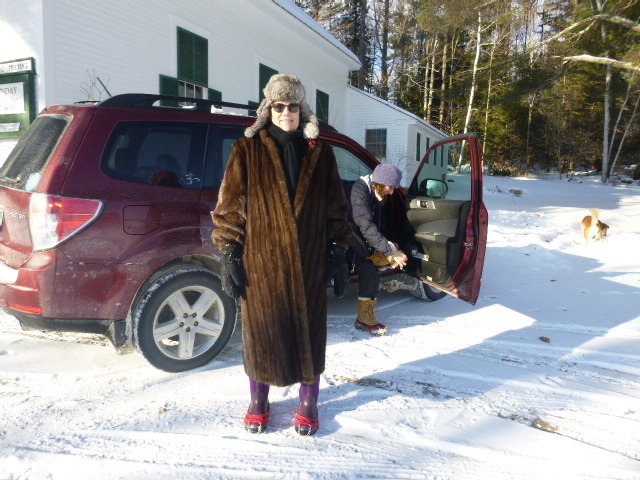 Is that the perfectly perfect winter look for rural New England or what? Mink coat, Boggs boots with heavy-duty grippers, and a fur-trapper hat. Chico, for Chico, likes Sophie. She’s respectful of his space. 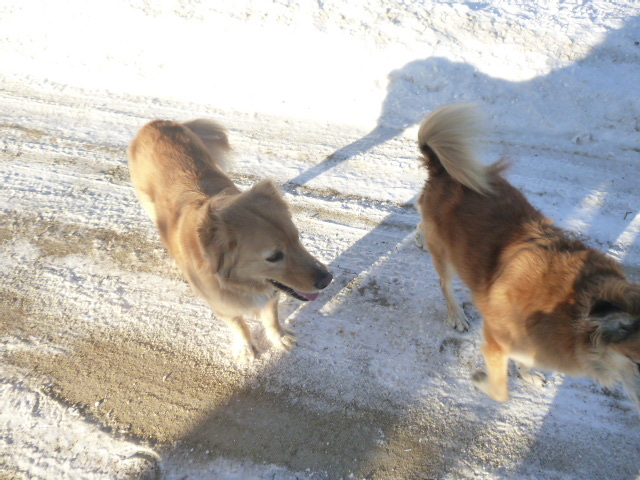 And that respect allows Chico to let Sophie get close to him, and me. We walked, we chatted, the dogs smelled things. It was relaxing and nice. 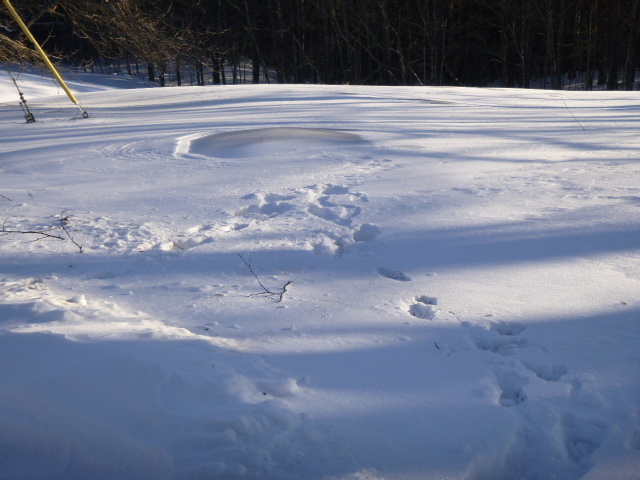 The wind did fun things with fresh snow that had fallen atop a layer of ice, carving out shiny spots in the matte snow layer. This was the neatest thing like that we saw. 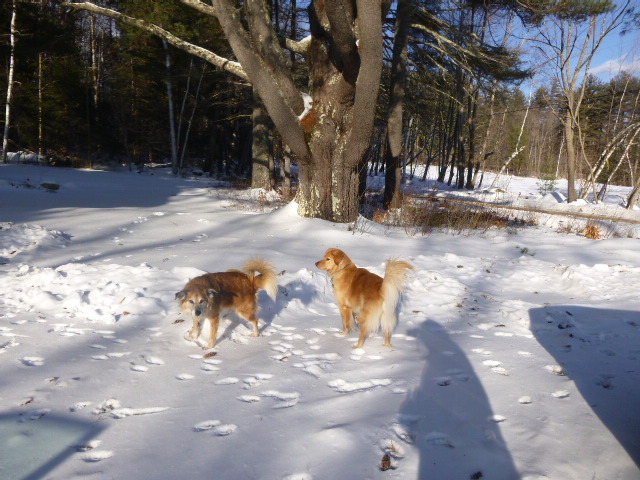 Early Sunday Chico and I went to Sure Fire Dogs in Nahua, NH and tried another organization’s agility trial. This was UKI, United KIngdom International. and the courses were indeed international style. I made a plan for the course in each of five of classes I signed us up for. I was only able to even try to execute one (where we ran out of time before completing). The other times we hit the ring there was a big, fat, sloppy, hot mess for our allowed time. Dog refusing to stay on the start line; dog refusing to leave the start line; dog smelling every corner of the ring; dog visiting the judge; dog leaving the ring; dog running past jumps. On one run, Chico missed the opening jump, so the timer didn’t start. After a while of watching us struggle, someone said, “The timer isn’t running.” I said, “Thank you. We’ll get out of here now,” and ran a short course to the out gate. On run five we pulled things together a little, but we were still slow, and it was a Masters Challenge Jumpers course and the buzzer went off after eighteen and there were still two obstacles. But I got at least two really good sets of weave poles during the day, and was smart enough to know I had a sticky, sticky, sticky dog that day and handled appropriately. We met a new venue and managed to overcome some of its challenges. I’m pleased for us. And would I do it again? Yup. The courses were challenging. They were things that at Julie’s I might have to do them a few times to really nail ’em. At many trials, I look at the course and go, aww heck, we could nail that at Julie’s, the challenge is the trial setting. These courses were hard in themselves. I liked that. Do I feel better about having trouble when the course is hard too? Maybe. This entry was posted in Uncategorized and tagged Gotcha Day Got Ya Day, UKI agility. Bookmark the permalink.